Happy weekend of card-making, shopping, and baking ~ or whatever wraps your present and makes you smile! I have another scrollable photo parade for you of QACAS snowy creations without waffling from me. 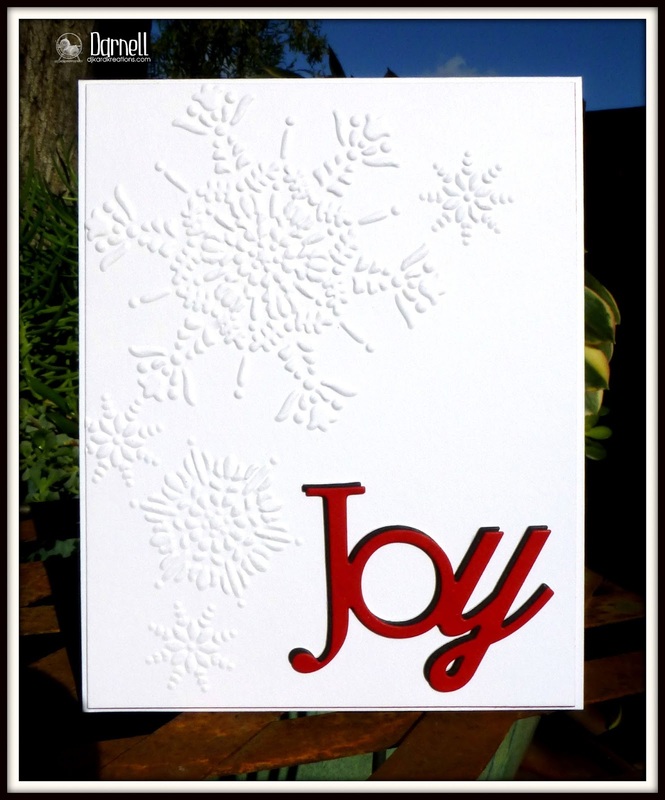 The theme today is snowflakes because mostly I wanted to play at Inkspirational Challenges because my friend Jane of Onions and Paper is the Guest Designer and the theme is "Flake." I could have made a card about the guy who used to run the tire store in the town where I grew up. You never knew if he was going to open on time or open at all or close early or what. I heard the adult persons refer to him as a flake. Seriously, how does anyone ever learn English? Oops, that sounds suspishushly like waffling. Let me know if you would like any details and thank you for the visit! I've still got more to make! The first three are helping me use up my patterned paper from PTI. All those polka dots and baubles inspired me! 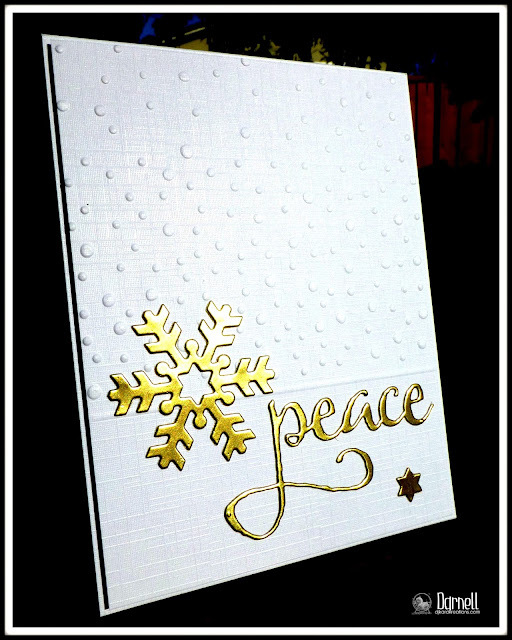 Challenge: Christmas Cards All Year Round: Keep it simple. Challenge: Addicted to CAS: Code word: Joy. 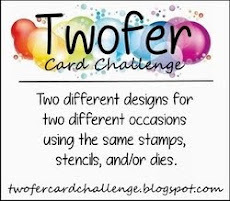 Challenges: Addicted to Stamps and More: Clean and simple. So many cards, so much gorgeousness! 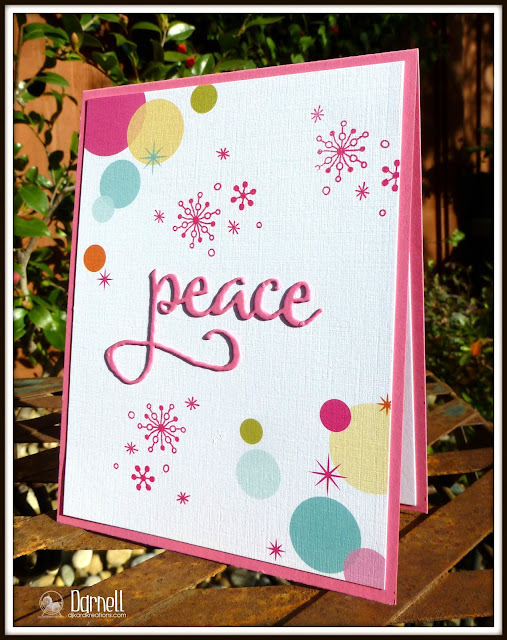 Fabulous cards - i love them all! What a lovely collection of cards. My absolute favourite, of course, is the dragonfly, but then I'm totally addicted to dragonflies. Thanks for the mention! No flakery here! I really don't know where to look or rest my eyes TOO MUCH INSPIRATION [as opposed to information! ].....love em all. Might have to pinch the lot for next year's ideas of cards. MY favest bit [I think] is those bauble-ish circles. I think.....hang on.... LOL!!!! Darnell, They are all lovely. I really like the snow effect on the wording on the third one. Fab set of cards Darnell, you are on a roll gal! I particularly love the first one in the set. Oh wow! All your snowflake cards are gorgeous! I love your first two with the colourful circles the best. Glad to see you over at Ink too! Sorry I haven't been by lately. With the kitchen reno and Christmas coming it's been a bit crazy here. Just keeping up with DT duties has been hard. But the kitchen it looking good and should be fully functional by the end of this weekend. Yay! It won't be completely finished like the trim or backsplash but enough that it's useable again. :-). Well, gotta run. Once again, your cards are just beautiful! Hugs! Such a wonderful Christmas cards you've made. I love them all. Too funny ... I am actually reading a book right now about the guy that runs the auto shop in town and his employee isn't reliable and they all call him a "flake"! LOL!! I loveeeeeeeee your cards!! GORGEOUS!!!!!!!!!!!!!!!!!!!! Wow, what a bevy of beautiful cards, Darnell! (How's that for alliteration?) My favorite? The "peace" card, towards the end of your lovely line-up! All your cards are gorgous, and I love expecially the first and second one, so fresh and joyful! You are on a roll. Love all of these CAS cards. Simply beautiful. Wonderful parade of cards! All are so pretty Darnell. Hey, I've known a lot of 'flakes' in my life - and may even be one myself! Yikes! Beautiful cards Darnell. Love the design of each one. Have a great weekend. A great collection of "flakey" cards. Wonderful. A festive display of clean and simple beauties! Just shows to go ya that less is more! I doing it again and picking a fav (I know you won't be surprised which one I chose)...it's the STUNNING gold snowflake with the golden sentiment! Bee-u-ti-full! Well you have spoiled us here, some fabulous cards with fabulous dies and fabulous colours and layouts. Got it yet? I love them! Wow! How do you keep rolling out so many gorgeous cards all the time?! So hard to pick a favourite as they are all so pretty. 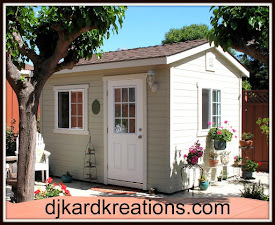 I love all that gorgeousness you displayed on your blog post. What wonderful Christmas card creations. What a wonderful festive fest! They are all marvellous and would grace any Christmas mantle beautifully. That ol' hamster wheel is just a turning, Darnell. You crank out cards faster than a duck on a June bug. And not only fast, but beautiful, too. You are on a roll my dear friend...what a wonderful collection of holiday cards, love them all. Oh Darnell.....have you opened a shop?.....you are like a machine turning out all these fabulous cards. They are all my favourites!! I love every one of your cards, Darnell! Honestly, how do you do it? I've about 10 more to make plus a couple of birthday cards from December birthdays in my family! Sigh. But joy and hugs to you! Oh goodness--look at all your gorgeous cards! You are so productive and every card is a beauty! Gorgeous! I especially like the first that swooshy flake! Fabulous cards, Darnell. So how many Christmas cards have you made, for goodness sakes? Are these part of the 100+ or in addition to that lot? I am SO impressed. I felt pressured making only a measly 85! What a fabulous collection of "flaky" cards"! Beautifulness abounds with this array of gorgeousnessssssss. Love them all Darnell but most of all Your CAS-ual Fridays card its simply glorious. Oh gosh Dippy, you're on a roll with all this wonderiferous array of cards. They are all gorgeous. Your cards are stunning ... Love them!! Wonderful "flaky" cards! 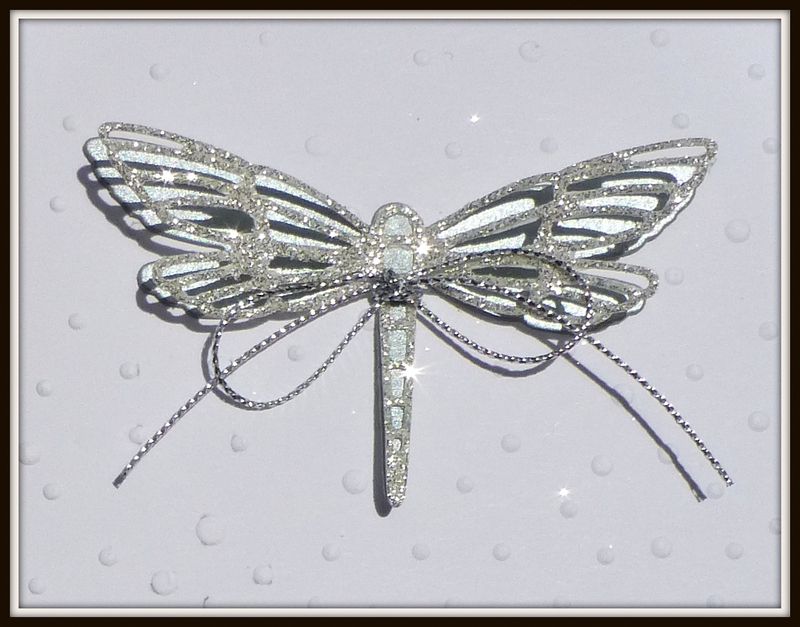 Love that sparkly dragonfly especially! What a great idea! Wow, Darnell, you've been busy and have made use of the designer paper, the cards are gorgeous. Enjoy rest of the weekend. 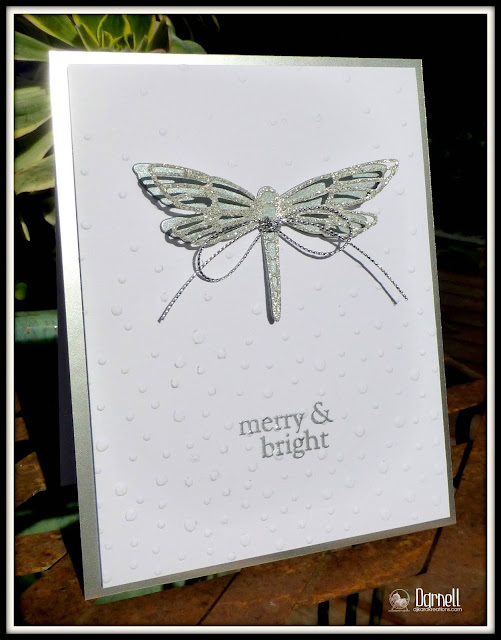 an array of gorgeous cards, Darnell, filled with wonderful flakes and even a sparkly dragonfly! Boundless creativity you have, my friend, boundless! I'm getting closer to finishing my cards and then those babies are heading out to find new homes! Advent Countdown nearly done, too. Thank you so much for sharing the incredibly pretty blue snowflake with us in the Ink gallery! Love them all, but most of all I love your brilliant use of the dragonfly, never seen one on a Christmas card before. I'm in a phase of loving using non Christmas images and dies for Christmas projects, so this one really caught my attention. I have been suitably impressed by your recent output of stunning work. What an amazing array of gorgeousness. I'm especially gob smacked by that dragon fly. Talk about a magical card...WOWZERS! Have to say I'm really envious of the way you can get so much done. Makes me feel like a snail. Incidentally...the tire guy clearly had other things on his mind besides tires. A bevvy of absolute beauty Darnell - I think I've finished my Xmas cards for this year but this collection makes me want to dash off and make more! Great to see you've played along at ATCAS and love the complete CAS take with the subtle snowflakes and striking 'JOY'. Great work and thanks so much. Hi Darnell - what can I say - another fabulous collection of cards! Think I've only got one more to make then that's it for this year! Wow Darnell, what a stunning collection of cards! 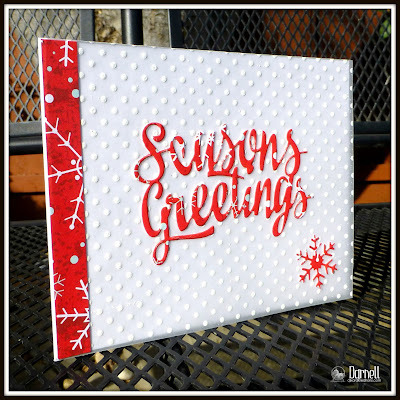 I love snowflakes & snowmen & haven't made one of those cards in ages, but you've inspired me with these beauties, Darnell! Love every one! You have been busy! Awesome cards, lady! SHAZAM you are on a crafty roll Darnell!! 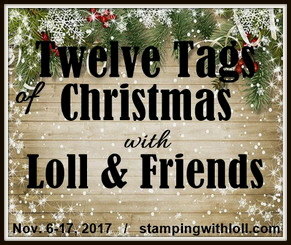 These are all amazing, love those big embossed snowflakes!! What a fabulous selection of cards, you have been so busy! I just love snowflakes too! 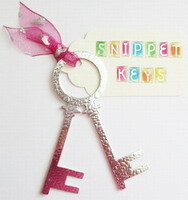 Wow!These are so fabulous and adorable and can see you have been busy. Love them all. Great to get treatet with so many cards! Love the first two; good to see what a difference one element can make! Love your snowflake goodness. Better on paper than on the ground! 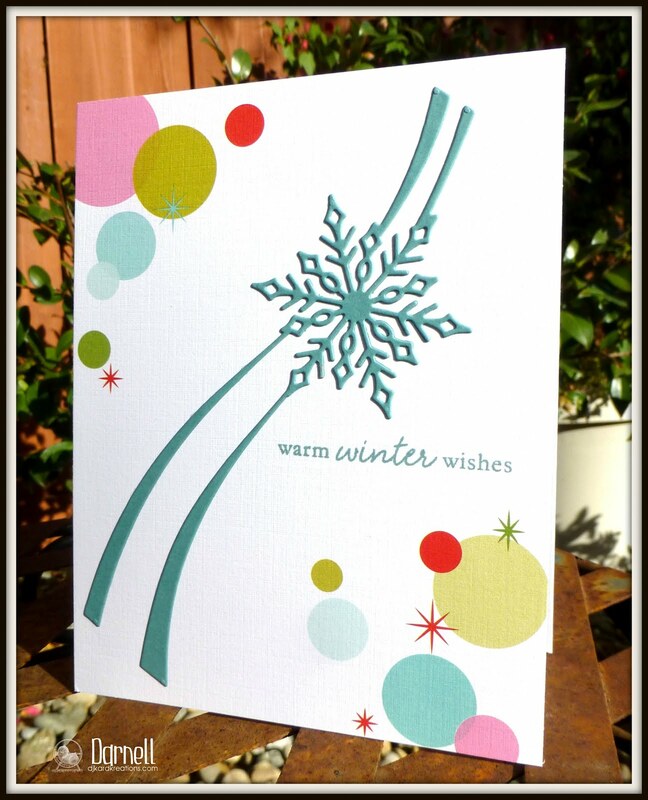 The first card with the snowflake and circles rock! Your red card is so festive. 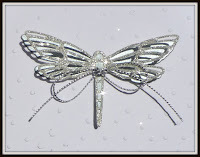 I love your other snowflake card and the dragonfly card is fab! Happy holidays! Wow, Darnell. You have been busy creating such a wonderful collection of cards. Thanks so much for joining us over at Time Out. These are wonderful cards Darnell - Hammy must have been very busy helping you crank out all these die cuts! Gosh these are super duper but do have to go with the last one as being my favourite of all. Now I need to have a quiet word with you about Hammy. It was absolutely brilliant of you to fly Hammy and The Hammettes over for the Nativity rehearsal but I do questshun the words that they were singing to the Carols that I sent you a list over for them to learn. Poor Mary nearly gave birth there and then and Joseph had to cover up her blushes with his tea towel. Corse the ducks thought it was hilarious and followed up with their own vershun and then the hens decided to add another verse. I had complaints from the neighbours bout the noise decibles being emitted. I also have my spiccsions that it was one of the Hammettes (they all look the same so can't point the finger ) that switched the choklit fondu machine to full speed ahead( right left and centre). Good job Miss is laid up and Parsnip was out for the count having got sozzled on rum soaked raisins and selpt if off in the crib through the whole shenanigans. Just hope we get it right on the night as tickets are now sold out and going for astronomical prices second and third hand. I did hear a rumour that Fergus (Hetties furry friend) had set up a printing press behind the potting shed!! As for that Elf............. Hugs Mrs A. 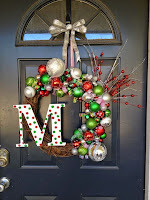 Happy holidays Darnell, lovely collection of holiday designs. Amaxing array of X was cards... All so inventive and pretty! Great job! Thanks for taking TIME OUT and joining our challenge! Wow Darnell all your cards are fantastic! as I always tell you your work is so inspiring! I love all these special cards! Great job embossing. These are all lovely, but I definitely have a favorite! The dragonfly! So elegant! Lucky you! Having help using up your design paper....I wish I had that too, LOL. Congrats on the Top 3 at ATC--Merry Christmas! Another Congrats in order, Darnell! LOVE all of your beautiful and inspiring cards.